Last night , I attended the memorial service of Charles Carr. He passed away suddenly this week from a heart attack. 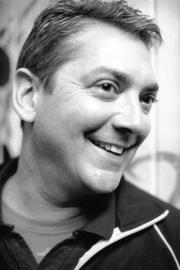 He was one of the more familiar faces I have known in the Castro District over the years here in San Francisco. We were not close friends. We always said Hi to each other and once in a while had friendly conversation. He was close friends with some mutual friends of ours and he even dated one my one my closest friends years ago. I will always remember his smile. I usually saw him either at the Midnight Sun and always , always at the Mix. His passing impacted me. 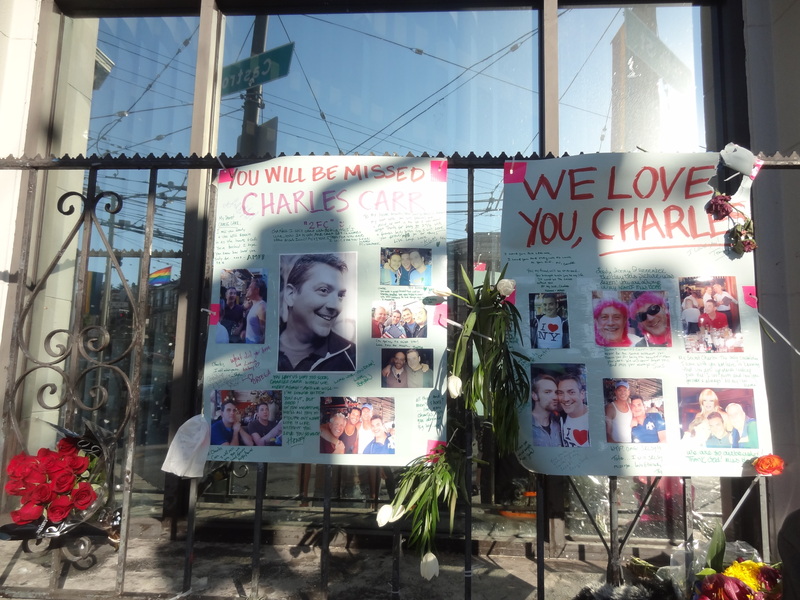 I found out when I saw his makeshift memorial tribute on the corner of 18th and Castro set up the other night. I could not believe he was gone. There is something when a Castro local passes away. There is a gaping hole in the community. We all feel it. Especially when a sweet, loving, fun man like Charles leaves us. The memorial service at the Mix was filled with both laughter, sadness, warmth and the deepest sense of community. Charles brought us together. How poignant it was to see and hear his sisters speak. Tears flowed when his father spoke about the love he had for his son. I think many of us ( especially gay men) were touched by a father who expressed hope that his gay son knew how much he was loved by his father. Charles life was celebrated by love, humor and beautiful music. Balloons were set off into the beautiful sky with messages by all his friends and loved ones with messages written to him on them. It was a beautiful sight. Those attending the memorial were urged to look at each other and to remember each other , cherish each other, and express love to each other. Each moment in life together is precious. We raised our glasses and toasted Charles. We toasted his life. It was a pure, sacred moment. There was a candlelight vigil that followed. I did not stay for that. There was so much to reflect on and my emotions were raw. I saw some close friends and talked to a couple of friends on the phone that evening. That night seeing and /or hearing their voices meant more to me than ever before. As I walked back to my home, a memory came into my mind, Charles walking down the sidewalk saying , ” Hi JP. Just going to the Mix.” Then Smiling. Thank you, Stuffitellmysister. He was a good man. That will be missed. So sorry to hear of his passing-the mix is my neighborhood hang out and haven’t been in a few days….I went tonight and saw the large poster of Charles on the window outside and was shocked. I just had a lovely conversation with him 2 weeks ago…he will certainly be missed! Thank you for your comments, Rebbeca. He will be missed. I knew Charles back when I lived in SF 2000-2005. He was a good guy. I know how much his passing has affected those that loved him deeply. He was certainly a good guy. Thank you for adding your sentiments.